We did it Uptown. We have now crossed the Rubicon – this is our 100th post. Going forward, we will continue to provide only the coolest, most cutting-edge, most relevant content on this truly vibrant community that we call home. Uptown is in our blood. 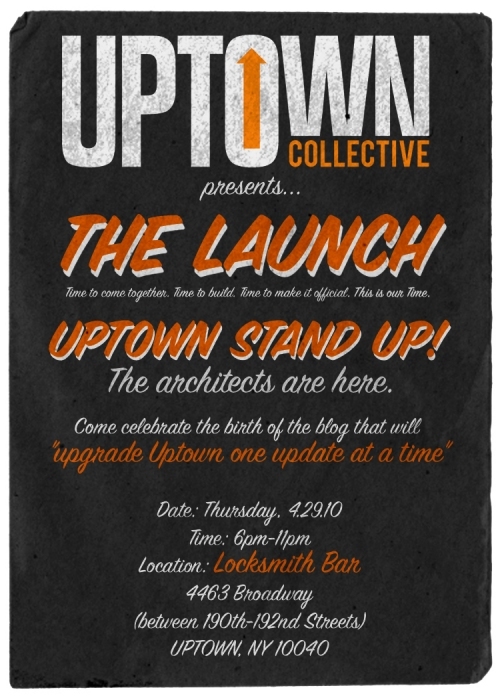 Uptown is the hometown of hustle and we are its hometown heroes. We would not have made to this point without the vision, faith and tenacity of Leopold, M. Tony Peralta and Rafael (R). Many thanks go out to our contributors who have worked tirelessly to widen the range and scope of this endeavor – Carolina Pichardo, Briana E. Heard and Oscar Monte De Oca. In the coming days, we will be adding a handful of new and exciting voices to the mix – so stay tuned. Also, it is imperative that we highlight the early support that we received from the good folks at La Sala 78 (Jose Morales and Jimmy Ortega), Bodre Cut and Color Room (Hector Bodre) and La Pregunta (Yscaira Jimenez). Last but not least, we cannot fail to mention our readers, the people that hit up our site on a daily basis, that tell their friends about us, that let us know that we are filling a void – many, many thanks. At the end of the day, this is not our site – this is yours. The future looks bright and it is ours to shape. With all that said, come and celebrate the launch of this site as well as this important milestone tonight from 6 PM until whenever at one of our favorite haunts, Locksmith Bar (4463 Broadway – between 190th and 192nd street).